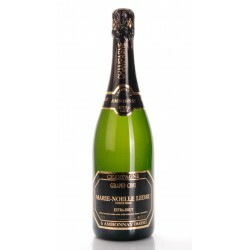 Marie-Noëlle Ledru can in effect be considered "the Pinot Noir Lady" since 1980 when, after the acquisition of 6 hectares of vineyard in the region of "La Montagne de Reims," has begun producing Champagne with a feminine touch in an area where reigns the masculinity of the Pinot Noir. Currently, varieties are the Pinot Noir of 5 hectares of renowned vineyards classified Grand Cru, and Chardonnay on a single hectare. In the vineyard the approach is aimed at a rational viticulture, that no researches bio labels, even if all the vineyards have grown without chemicals and herbicides for years; the eason is told very bluntly because getting a certificate would prevent the adoption of a chemical remedy in the event of an attack of parasites in which the use would be required to save the harvest. The base wines only see steel and always malolactic. Champagnes rest on the lees between 3 and 6 years, and each winery operation is carried out by hand by Marie-Noëlle Ledru, from remouage to disgorgement, even the dosage, made with a homemade filling.